Want To Be A Project Manager But Don't Know Where To Start? Put Off By All The Hype And The Cost Of Training? At Last – A Book That Demystifies All The Hype Around Project Management, And That Gives You The Skills You Need To Become A Successful Project Manager. I've been a project manager for over 20 years, and it has amazed me that in all this time, project management has remained one of the few professions shrouded in mystery. It's almost like a secret club! It's hard to get a foot in the door (unless you've been to university and got an MBA or something), and the cost of training is out of this world. Frankly, I don't know how some of them can justify the prices they charge. So – how do you break into this world, when you're not even sure you have the skills you need, or that you're even going to enjoy it? I mean – who wants to spend thousands of dollars on something, just to find out they hate it or they're just not cut out for it!! I worked with a guy once (let's call him "John") who came to see me one day to talk about project management. I was managing a project in a large financial services company at the time, and John was one of the Administration (or Operational) Managers. He managed a team of 20 staff, and they looked after people's pensions. Now, I don't know if you know much about pensions, but they are pretty tricky financial instruments, so John was no dummy. He had been doing his job for around 5 years, and was keen to get more experience, and hopefully a better job, within the company. So, John came to see me one day and asked me about getting into project work. He didn't know whether he wanted to be a project manager, but he saw what I had been doing and thought it looked pretty exciting. He was even more excited when I told him how much Project Managers get paid! We had a long chat about the sorts of skills needed in project management, and the sorts of things he would be expected to do. I suggested he speak to his manager or the Personnel department about opportunities within the company either to get some experience on a project, or to be sent on a training course. Well, guess what their response was? John was told he was far too valuable in his current role to be moved off onto a project (even if it was a part time role on the project). He was also told that Project Management training was very expensive (around $5000 for a course), and that the company only allocated $2000 per employee for training, so sorry – that's not possible either. John and I had another chat, and for the remainder of the time I was at the company, we met weekly for an hour and talked about project management. That was the best I could offer him. And not long after I moved on to another project at another company, John resigned and went looking for his opportunity elsewhere. It was people like John that convinced me that there is a gap out there that no-one is filling, and that's why I wrote Project Management Made Easy. You see, Project Management Made Easy basically explains what project management is (and isn't), what skills you need to be a successful project manager, and what the basics or foundations of project management are. It's almost like Project Management 101. My book contains everything you need to know to start increasing your skills today. It also contains valuable templates you can start using right now. this book will provide the kick start you need. As a contract Project Manager, I have worked with many different companies and project teams. I often come across people in these organisations who are keen to get more exposure to project management, but just don't know where to start (like John). And most project management courses cost thousands of dollars. Unless your company is willing to cover the cost, this is beyond the reach of most of us. That's probably why, most places I work, I end up running in house courses for them on basic project management skills and techniques. 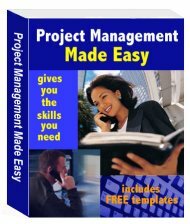 Project Management Made Easy is a simple, easy to use, guide to project management. Let me ask you, would you know what to do if you found out 2 weeks before your project was due to finish that your IT people wouldn't be ready in time? This book tells you what strategies you can follow to solve the most common problems facing Project Managers. Most courses cost thousands of dollars, and many books about project management are all theory. But, Project Management Made Easy is a practical, easy to follow guide to what you need to do to become a successful Project Manager. Secure your future now, and give yourself the opportunity to increase your earning power. Here's what some of my existing customers say about Project Management Made Easy. "Loved it - from beginning to end"
I had the great experience of working on one of Di’s projects – a multimillion dollar exercise that she made look like light work. I mentioned several times that I would love to learn some of her skills and that I thought she should write a book, so I was first in line to read Project Management Made Easy and loved it, from beginning to end. As a person working on the more creative side of the spectrum, I find it hard to digest great texts and I always thought of project management as a ‘dry’ subject – but that was before I read it from Di’s point of view. Project Management Made Easy clearly illustrated concepts and spoke on a conversational level that I enjoyed reading and I loved the examples and explanations of terminology provided throughout. I will have it by my side for the next project I manage – can’t wait to put it into practice! This is simply the most insightful and easy-to-understand book on project management I've come across. It was so easy to read and understand that I couldn't put it down even though I'm new to project management. Other books I tried just had me yawning. I loved how all the terminology is simply explained, not in a special section somewhere else, but right there when and where you need it. Now that I use it as a reference I also love the quick guide Glossary at the back of the book and the templates make it all so simple. This Microsoft Word template of a Project Management Plan is an invaluable way to document everything about your project in the one professional looking document. Never get caught out again! This Microsoft Word template will let you put together comprehensive status reports for all levels of management. This simple and easy to use budget template lets you track not just your budget and progress, it automatically calculates each month your progress and varaiance against budget. And the Summary level is just perfect to copy and paste into your Status Report! Only working on a small project? Use this Microsoft Excel template of a To Do List to document all of the critical tasks, their assignees and due dates. Now you can document and control all of the issues and risks related to your project in the one place. This Microsoft Excel template of an Issues & Risks Log will ensure you are in control of your project. So, How Much Is Project Management Made Easy? You can get your copy of Project Management Made Easy for the low introductory price of $37.95. We know times are tough for everyone right now, so for 1 month only Project Management Made Easy is yours for only $25.95. That's over 30% off! Project Management Made Easy, a simple, easy to use guide to project management that gives you the skills you need to become a Project Manager. the Issues & Risks Log. I am so confident in Project Management Made Easy, that I am offering a 60 days, no questions asked, 100% money back guarantee. That's right - if you don't like it, don't keep it. Just send it back to us here at ManageThatProject (email to info@ManageThatProject.com) within 60 days, and we'll send you your money back. Not Sure This Is For You? Why Not Try Our FREE 5 Day eCourse? If you're interested, but still not convinced this book is the real deal, then I'm willing to let you sample the quality for free. Just fill in your name and email address below, and I'll send you my 5 part Course on Troubleshooting (which is based on a chapter from Project Management Made Easy). This Course describes the 5 most common challenges you will face as a Project Manager, and tells you how to deal with them. OK - I'm in - sign me up for your Course on Troubleshooting the Most Common Challenges Facing Project Managers today. Interested in a Bulk Purchase? If you are interested in a bulk purchase for a company or training institution, we do have wholesale pricing available. Just email Diane at info@ManageThatProject.com for more information.